Organizational storage is supplied in full, by this warm five drawer chest for the youth room in your home. 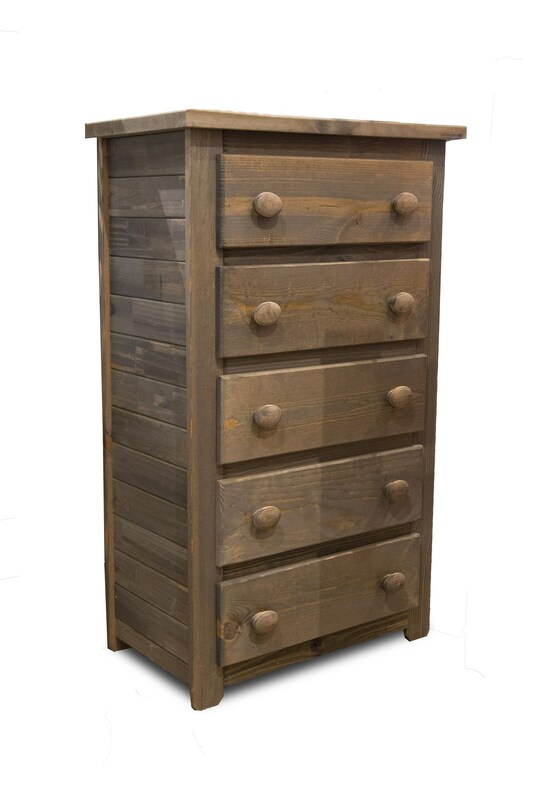 Featuring solid Pine construction with a warm walnut finish, and wooden pull knob hardware, this five drawer chest is a complete storage unit to hold all of the clothing and accessories for the youth in your home. The Walnut Five Drawer Chest by Pine Crafter at Great American Home Store in the Memphis, TN, Southaven, MS area. Product availability may vary. Contact us for the most current availability on this product. Transform your child's room into a charming, rustic retreat with this youth bedroom collection. Each piece is constructed from solid pine wood and left in simple builds with exposed slats and large wooden drawers knobs for a cozy cabin feel. A variety of beds and several storage pieces will easily furnish any bedroom with organized storage space and innovative sleeping arrangements. Left untouched for a fresh, natural pine wood look, this youth bedroom is a wholesome, welcoming group that will easily become a fast favorite with any child. The Walnut collection is a great option if you are looking for Rustic Casual furniture in the Memphis, TN, Southaven, MS area. Browse other items in the Walnut collection from Great American Home Store in the Memphis, TN, Southaven, MS area.